Waterdeep Belongs to the Underworld! Beneath the City of Splendours lies the sprawling dungeon of Undermountain and the criminal haven of Skullport. Now you can add one or both of these subterranean locations to your Lords of Waterdeep game. Lords of Waterdeep is a competitive board game of fantasy intrigue. The Skullport module adds a new resource to the gamer: Corruption. I you're willing to pay the price for accumulating Corruption, the rewards can be great. The Undermountain module features bigger quests, richer resources, and more ways to get both. 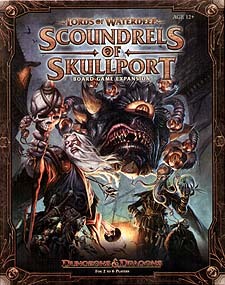 Scoundrels of Skullport includes new Lords, new Buildings, and new Intrigue and Quest cards. This expansion set also adds a new faction the Gray Hands, allowing up to six player. You must have the Lords of Waterdeep game to use this expansion.